Tune to Afternoon New Music from 3-6PM on Monday, September 22nd to hear a live interview with Billy Martin, Evan Lurie, and Steven Bernstein of the avant-jazz group, the Lounge Lizards. 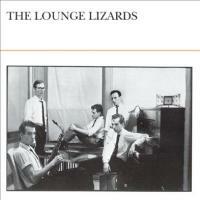 The Lounge Lizards formed in the New York in the late 1970s, founded by saxophonist John Lurie and pianist Evan Lurie. Tune in to hear the Lounge Lizards discuss their upcoming performances at Town Hall and at the Strange and Beautiful Festival. Listen! Initially conceived as entertainment for a downtown New York art community (which, at the time, was knee-deep in no wave),the Lounge Lizards spent more than a decade with various lineups playing jazz with pop and avant-garde rock tendencies. The band's initial incarnation was led by saxophonist John Lurie, with brother Evan on piano, Arto Lindsay on guitar, Steve Piccolo on bass, and ex-Feelie Anton Fier on drums; this lineup appeared only on the band's acclaimed, all-instrumental, self-titled 1981 debut. Lindsayand Fier left shortly thereafter, each embarking on a lengthy series of projects, and the Luries recorded Live From the Drunken Boat in 1983 with a different and less compelling lineup. In 1985, during a hiatus in which Evan Lurie recorded his first solo piano album, the collection Live 79/81 was released; the group also recorded with producer Teo Macero and the London Philharmonic. the Lounge Lizards regrouped in 1986 with both Lurie brothers, saxophonist Roy Nathanson, trombonist Curtis Fowlkes, guitarist Marc Ribot, bassist Erik Sanko, and drummer Dougie Bowne. This lineup recorded Big Heart Live in Tokyo(1986) and the studio LP No Pain for Cakes (1987), the latter of which featured the group's first vocal number. 1989's Voice of Chunk was initially sold only through the mail, but has since been reissued on CD. John Lurie has also done scoring work for several Jim Jarmusch films, including Stranger Than Paradise (1986), Down By Law (1988), and Mystery Train (1989).